There’s a curiously moving photo in a 1930s medical handbook put out by Dr. Elliott P. Joslin, who started a clinic in Boston that still specializes in treating diabetics. 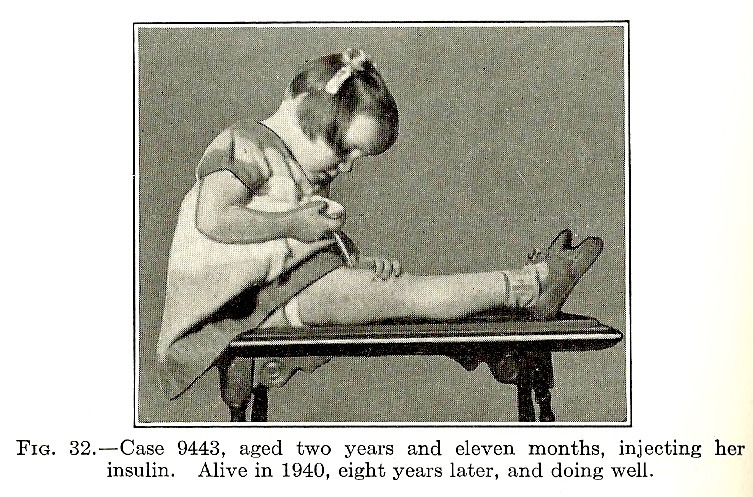 It shows a sweet Shirley Temple clone, almost 3 years old, the caption says, sitting on a wooden table and injecting her doll-like thigh with a needle and syringe that contains a dose of insulin. (A darling voice muffles an “ouch!”) She’s just a baby, yet she’s her own life-saving nurse. I became diabetic at 7 and almost died because the family doctor hadn’t the sense to recognize an ailment that even ancient Greeks could spot in an instant. Here I was, a curious invalid at home from the hospital, with fretful parents who previously thought that the dangerously orange-flavored St. Joseph Aspirin for Children (“Try it, Mother, and be wise!”) and Vicks VapoRub were all anyone needed. Now their boy required repeated shots of insulin, and they had to be “clean.” Yes, someone, a nurse with a cap, I think, said the word clean. Although I can’t recall the place it happened or the person who showed us, Mom and I – Dad, as usual, was elsewhere — got a lesson in sterile technique. Later, I discovered that “sterile” meant a whole bunch of things. This was before the invention of disposable sterile syringes and needles, which would have made my morning ritual much less memorable. Our glass syringe, previously rinsed many times with tap water to get the old, dirty insulin out, was to be boiled in the same water — needle taken off and placed alongside — in an enamel pot on the gas stove, “to kill the germs.” (Another disembodied voice, that one.) You wouldn’t want to inject what gives you measles and polio into your blood, would you, little boy? I was thankful that my parents, who did discuss the option, chose not to buy a sharpening stone that would extend the life and lower the cost of my thick metal needles. They spent the money on the new ones. Could germs get on the syringe as it cooled and you prepared to fill it? We were shown how to remove the hot equipment from the stove with surgical tweezers (do you boil them too?) and swab the rubber top of the insulin vial with a cotton ball soaked in rubbing alcohol, “to sterilize the surface.” Every day I carefully and proudly swiped things I couldn’t see, back and forth, off the top of the vial. But what liars. I found out later that unless you treat an item with alcohol for 10 minutes or more and let the potion evaporate completely, alcohol doesn’t kill, it merely cleans. Water would do just as well. “Drugstore salesmen must have invented sterile technique,” I said to myself, but that was later, when I was marching against the war in Vietnam and no longer believed anything anyone told me. For ages I’ve been using packaged alcohol swabs because childhood habits are hard to throw away, and I think I obtain some comfort, a feeling of safety, from their remedial smell. I get the swabs through my health plan, though the provider charges $12 for a box of 100, triple the pharmacy price; health insurance is ruining this country. By the way, those swabs remove spots and finger grease safely from computer screens, if you buff the surface with a soft cloth as the liquid dries. Before I got wise to the alcohol thing, an ex-Navy cousin of mine (let’s call him Ben) took teenage me on an overnight trip, partly to teach me to drive, but in fact to butch me up and clue me in about girls and drinking, because my father was worried I’d never learn. Excited, I packed insulin and equipment, but forgot the crucial cotton balls and alcohol. After an illegal, white-knuckle jaunt through New Jersey to a midnight Maryland motel, I readied my kit and saw my mistake. No dummies, we soaked a wad of toilet paper with some of the cheap Scotch that was to be my booze initiation. Ethanol, after all, is alcohol too. I rubbed the Scotch on my thigh and sniffed as it wafted up. Good! To be safe, I rubbed myself again: a double. How brave I felt, and grown-up. I may have had some of the whiskey to drink before I went to bed, but all I can really remember from that not quite sterile night is how much I wanted Ben’s arms around me. Wish to be alerted to a new 'Out There'? Just write YES and leave your email. Thanks!